It looks like a castle keep with its crenellated top, just the place from which to pour boiling oil down on the heads of any knaves and varlets trying to capture Loy Park. But there has not been an attack of knaves and varlets in quite a while, so what is up with Grayson County’s medieval monument? 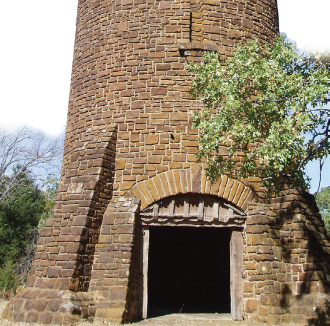 The stone tower in the park stands on a small hill just off the road to the fairgrounds. It is separated from the lake by a cluster of oak and pecan trees. It looks out of place, as if it had been stripped from some medieval castle and brought to the lake for no other reason than to arouse the curiosity of passersby. It was not always a mystery though. Mildred Christman, an employee of Frontier Village and longtime citizen of Grayson County, remembers exactly why it is there. It was a water tower. “It supplied water to the concession stand at Loy Lake Park,” she said. “There was a dance platform, a diving board, a nickelodeon; younger people hung around. There was a lot of activity back then.” “Back then,” was the 1930s, before World War II, when Civilian Conservation Corps Company 857, two hundred strong from Wisconsin, came to build a county recreational park. When they went home after six months work, they left behind a dam, a lake, a recreation center, a road, thirteen bridges, six picnic units, a baseball diamond, and the water tower, which was only partially finished. Forty-eight local men were hired to finish the job. Grayson County Park was renamed Loy Park in honor of County Judge Jake Loy, and before the war the place was a popular attraction for county residents. After the war, the action moved to Lake Texoma and activities at Loy Park slowed down considerably. As for the knaves and varlets, if they ever do show up with evil intentions, we’ve got a place to hold them off. Hope we have time to boil the oil. Editor’s Note: The Civilian Conservation Corps had a major impact on Texas by constructing the state’s first parks. As one of President Franklin D. Roosevelt’s most popular New Deal programs, the Civilian Conservation Corps put unemployed young men to work on conservation projects across the United States. Here in Texas, the CCC built roads, planted trees and prevented soil erosion. Hiking trails, picnic shelters, cabins and swimming pools turned beautiful nature spots into recreational parks.